It’s not infrequent to hear the name Bali mentioned along with “paradise”. 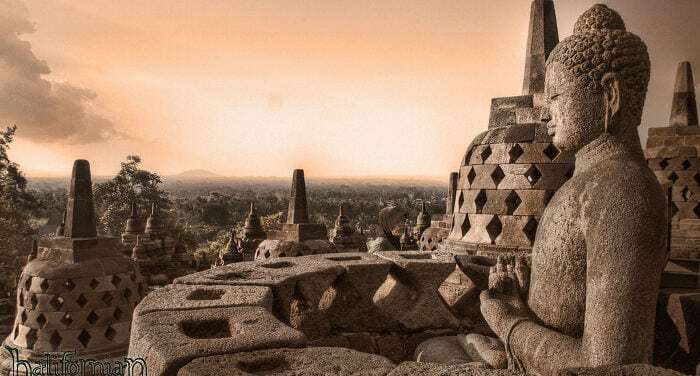 This slice of Indonesia gained its fame as one of the most memorable places in Asia to vacation. Without a doubt, it’s a marriage between a varied territory suited for all forms of tourism, and an innate hospitality that has made Bali so renowned. Moreover, over the years its offerings have improved to the point of being suitable for all budgets. From Obama to backpackers! Bali is part of the Indonesian archipelago. In particular, it is located between the larger island of Java and the smaller one of Lombok. The Strait of Bali separates Java from Bali and can be easily crossed by boat. Connections with Lombok and the Gili Islands have improved and increased in recent years. Once used as a military outpost during the Dutch East Indies colonial era, Magelang still maintains the legacy of its military past by being home to the only National Military Academy in Indonesia. However, it never ceases to amaze tourists with its beautiful scenery, the hospitality of its locals and its tranquility, cool air, and delicious food. It is probably the only city in Indonesia that has a mountain right downtown, called Mount Tidar. In addition, Magelang is also surrounded by seven mountains: Mount Merapi, Mount Merbabu, Mount Sumbing, Mount Sindoro, Mount Andong, Mount Telomoyo, and Mount Gilipetung, making it a perfect destination for people who love hiking! There are several options for getting to Magelang. Since there are no direct flights to Magelang, you will need to switch over in Yogyakarta, the nearest transportation hub.